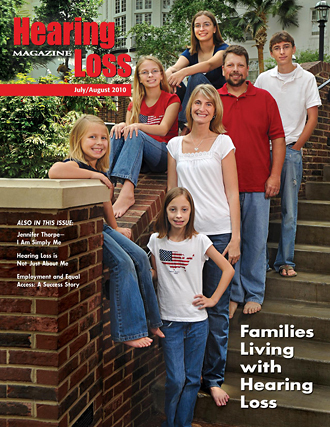 The July/August 2010 issue of Hearing Loss Magazine (which I design and produce bimonthly for the Hearing Loss Association of America (HLAA) features Jennifer (Jen) Thorpe, an HLAA member. I met and photographed the Thorpe family in Nashville last year at HLAA’s annual convention. 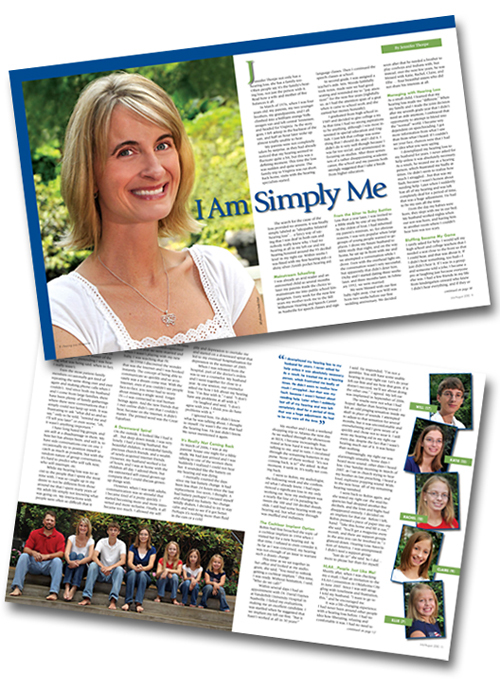 In her article, I Am Simply Me, Jen shares how her hearing loss has affected not only her but her family as well. The issue is en route to HLAA members shortly! You can read more about Jen’s “journey to bilateral bionic hearing” on her blog, Stereophonic Bionic. I discovered Jen on Abbie Cranmer’s blogroll, which I found during a random search for hearing loss-related blogs. It turns out Abbie and Jen were already friends. Now both have been profiled for the magazine! I’m thrilled to report that Abbie and her husband-to-be, Todd, have hired me to photograph their wedding in mid-September. They’re getting married in a botanical garden in New Jersey—-how dreamy is this photography gig? Jen will be one of Abbie’s bridesmaids, so I’ll get to see her again this fall, too. Author Cathy Kooser’s excellent article, Hearing Loss is Not Just About Me, outlines her maladaptive coping strategies—bluffing, dominating the conversation, withdrawal and selective hearing—and how they impact her family and friends. Cathy is a licensed independent social worker with a severe hearing loss, and lives in Dayton, Ohio. Audiologist Mark Ross’ article, Understanding and Managing a Severe Hearing Loss, identifies what qualifies as severe hearing loss and explores treatment options such as cochlear implants, hearing aids, directional microphones and hybrid implants. Mark is an associate at the Rehabilitation Engineering Research Center (RERC) at Gallaudet University. He is a regular contributor to the magazine. And finally—my dear friend, Tom Hedstrom, writes about his father’s hearing loss in My Dad, the Ford Man. Tom’s father, Bernie, wore hearing aids for more than 30 years until he got his cochlear implant at the age of 92. Bernie is a long-time member of HLAA and loves reading and sharing the magazine. I photographed Bernie for this issue when he was visiting the D.C. area in May. All photos © Cindy Dyer. All rights reserved.